Performed by childhood friends Dan Haynes and Pete Richards, SIMON & GARFUNKEL THROUGH THE YEARS pays homage to the music of Paul Simon and Art Garfunkel. The 110 minute show charts the duo’s nostalgic journey from their first recording as Tom & Jerry at 16 years old to their final studio recording BRIDGE OVER TROUBLED WATER in 1970. 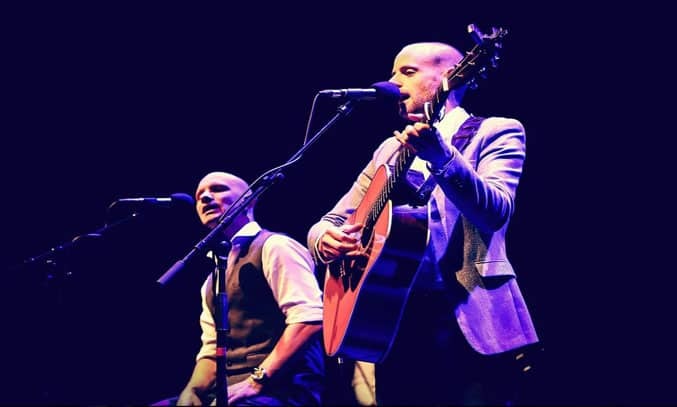 Bookends have toured the show since 2014, captivating audiences across the world with their authentic Simon & Garfunkel sound. The 2017 tour sees the duo perform hits from Simon & Garfunkel’s extensive back catalogue including MRS ROBINSON, THE SOUND OF SILENCE, HOMEWARD BOUND, THE BOXER and A HAZY SHADE OF WINTER, as well as acoustic versions of some of their early material such as SCARBOROUGH FAIR, LEAVES THAT ARE GREEN, A MOST PECULIAR MAN and WEDNESDAY MORNING, 3AM. Haynes and Richards perform the songs in a truly captivating way, delicate recreating the close harmonies and the exquisite vocal arrangements. Unlike their previous shows which made use of video and interview footage, the 2017 tour has been stripped right back to focus in on the music. Almost all of the songs are performed acoustically, with Haynes demonstrating his exceptional skills as a guitarist and live string quartet joining the duo for the bigger numbers towards the end of the show. The result is an intimate show which showcases some of Simon & Garfunkel’s best work. In fact, the only real disappointment is the lighting show, which seems to follow no structure and ends up distracting from the music. That said, if you’re a fan of Simon & Garfunkel, you’re sure to enjoy this multi-layered show, which finishes with Bookends’ own beautiful rendition of the unforgettable BRIDGE OVER TROUBLED WATER. SIMON & GARFUNKEL THROUGH THE YEARS tours nationally until 28 October 2017.